We will manage your mare prior to, during and after the foaling process. Foaling mares are stalled in a large foaling stall with 24 hour camera system. Experienced staff is available 24 hours a day to attend a foaling mare. We work closely with the Veterinarian for any after care the mare and/or foal may need. Mares due to foal will be turned out daily in a private turn out to insure her comfort and safety. Once the mare foals, they will be turned out daily in a private turn out. 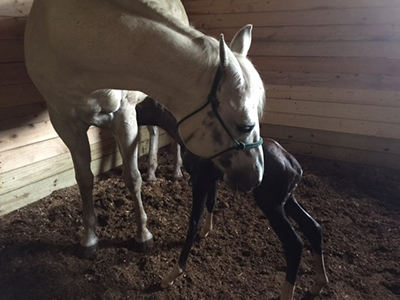 We will coordinate an IgG test for the foal, and schedule a post foaling veterinary exam for the mare and foal. In the event the mare or foal is in need of special care or support, we are equipped to manage most events. We will halter break the foal. Our foaling cameras will be available on this site for the mare owners to view live. A login and password will be given to the mare owner to access the camera.